It's a little family consists of mom, dad and a two-year-old boy. 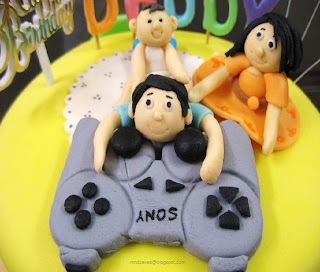 Dad is a typical family man who loves to play PS3 with his son at home after work. 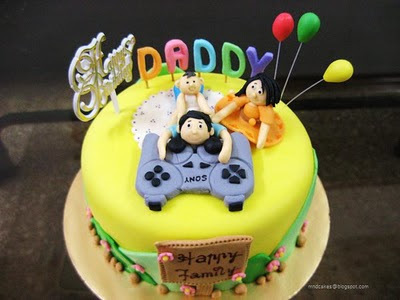 When dad's birthday approached, PS3 and his family naturally became the theme of the cake. It's a chocolate cake frosted with chocolate mousse and covered with rolled fondant. The kid is sitting on daddy's back while the mom is looking on. "It's a very nice cake!" 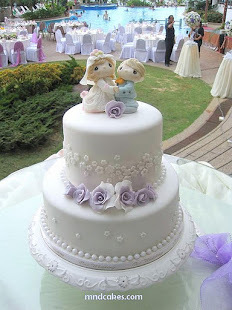 I got the sms from the mom right after the cake was delivered to the family on Penang Island. Sweet comments definately make our day! Thanks!